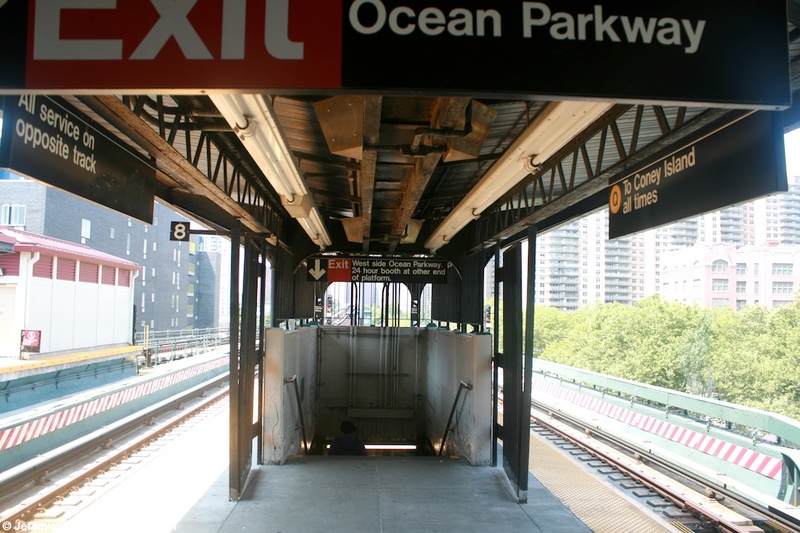 Ocean Parkway is a station on the Birghton Line, and one of only three that are on standard elevated structures directly above a street. 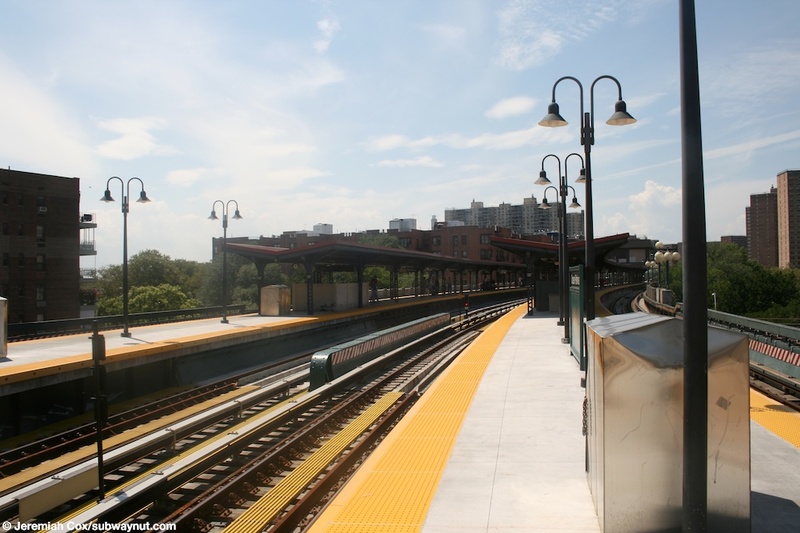 This is station is located above Brighton Beach Avenue, when it crosses the massive urban boulevard, with a wide main road, and one-way service roads on eitherside of it. The station's structure that crosses Ocean Parkway was decoratively covered with concrete. It has colorful, decorative tiles embedded into it. 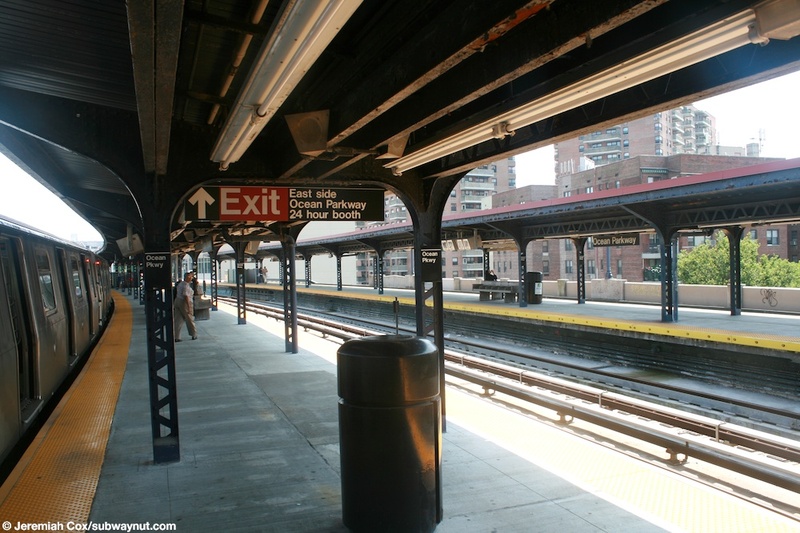 This treatment was added to a couple more BMT elevated structures when elevated lines go over more major streets. The station itself has four tracks and two platforms. 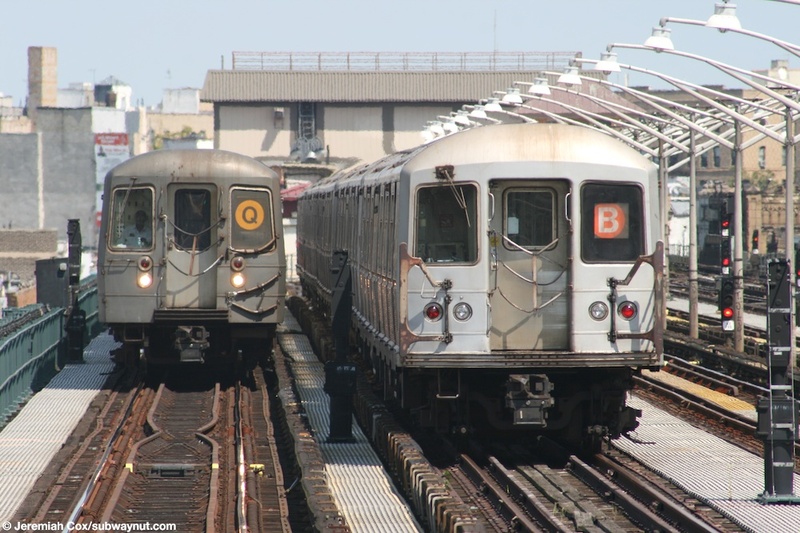 Ideally the station could be an express station, and the terminal of B Express trains except that the switches don't allow this. Immediately west of the station the in-use side 'local' tracks are switched onto the express tracks, to continue onto the stacked elevated at West 8 Street (there are still the skeletal remains of removed trackage from the times when the local tracks continued down to the lower level at West 8th Street. 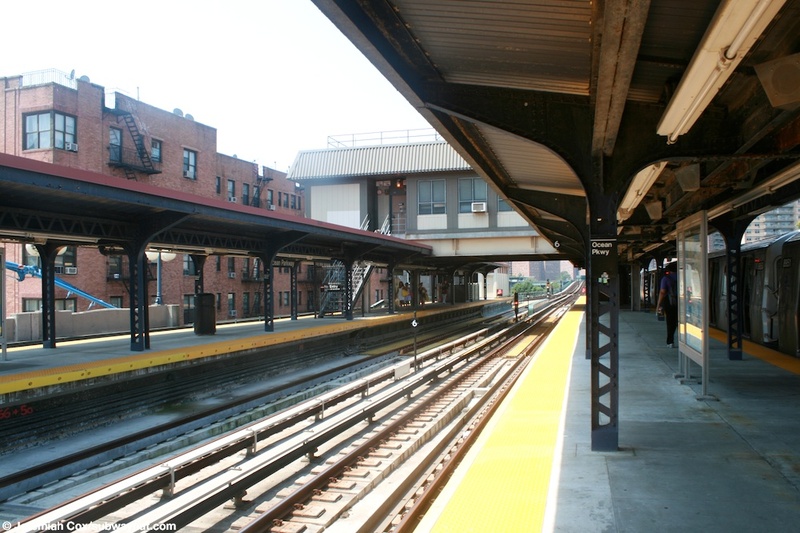 East (northern end) of the station, two extra lay-up tracks are visible between the unused through-express and local tracks, B trains are often visible from the Ocean Parkway Station being stored there. The station has two completely separate entrances/exits, Ocean Parking runs between them taking-up a good deal of space because the street is so wide. Begging at the western (southern) end of the platforms, a single staircase leads down from each platform to a station house beneath the tracks. This station house is unstaffed. 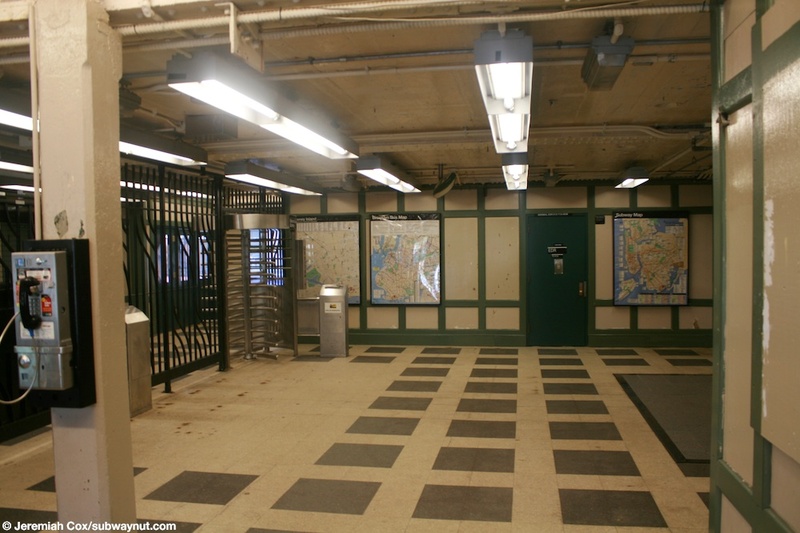 Two High Entrance/Exit Turnstiles lead from this relatively roomy area to a single pair of staircases (that lead to separate directions) on the North side of West Birghton Avenue, between Ocean Parkway and West 1st Street, albeit a bit closer to West 1st Street, even through the exit is signed 'West Side of Ocean Parkway' on the platforms. 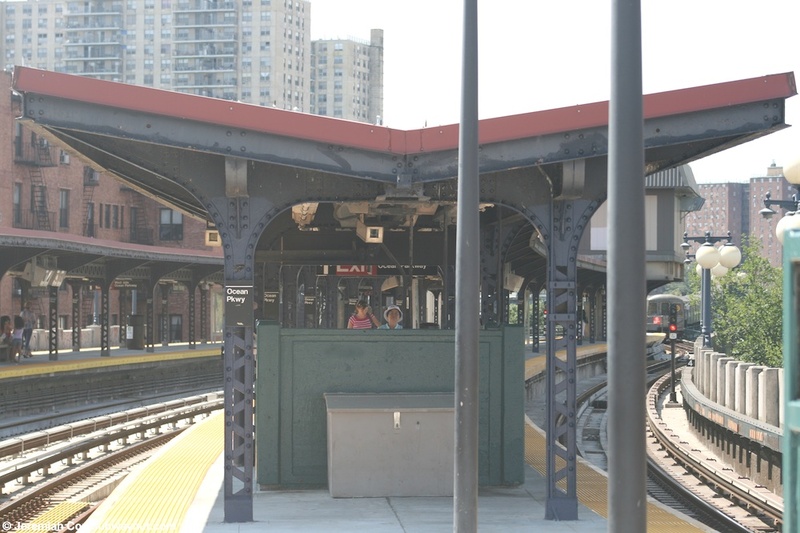 The primary station house at Ocean Parkway is towards the easthern (railway northern) end of the platforms where single staircases lead down to a relatively large station house beneath the tracks, that has the token booth facing its turnstiles. 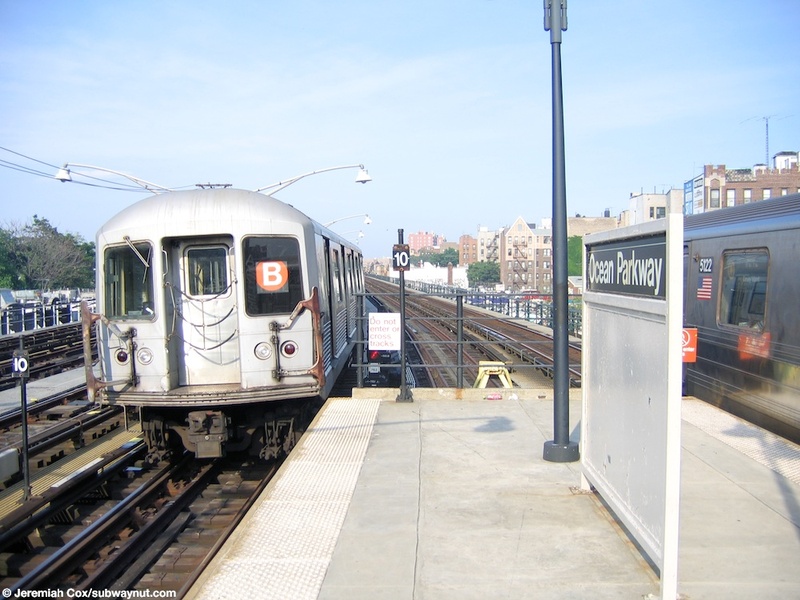 From here there are street stairs to both sides (2 down to each side, they junt away from each other from the station) down to Brighton Beach Avenue slightly east of Ocean Parkway. 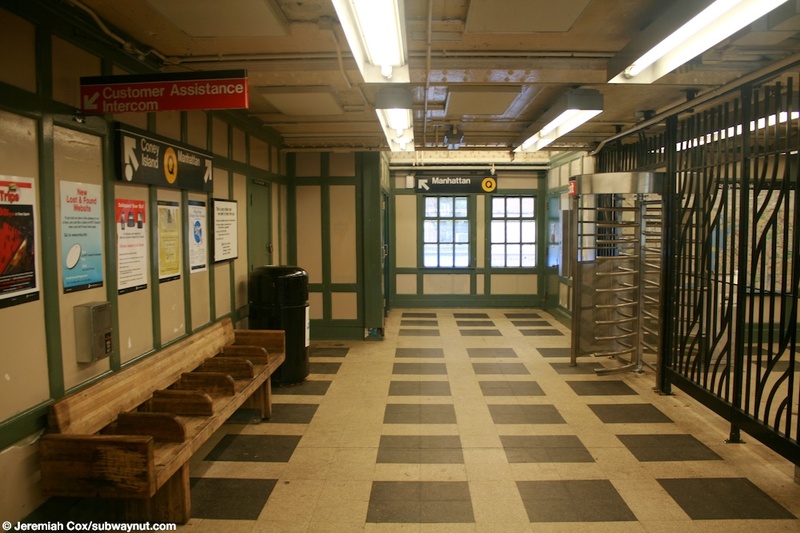 Both station house interiors at Ocean Parkway have unusual green detailed symmetric lines on top of a cream-colored background color. The island platforms are canopied for the their entire lengths between the single staircases down to each of the station exits. There is an exposed section of the platforms where they get quite a bit narrower at the eastern (railway northern) end of the station. 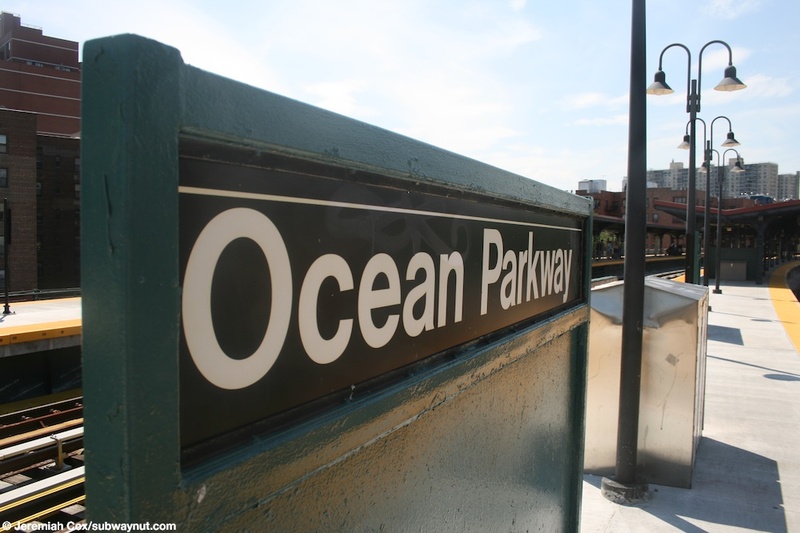 (ocean_pkwyq1) R42 #4935 is parked Not In Service, almost inside the Ocean Parkway Station, on the unused center tracks. 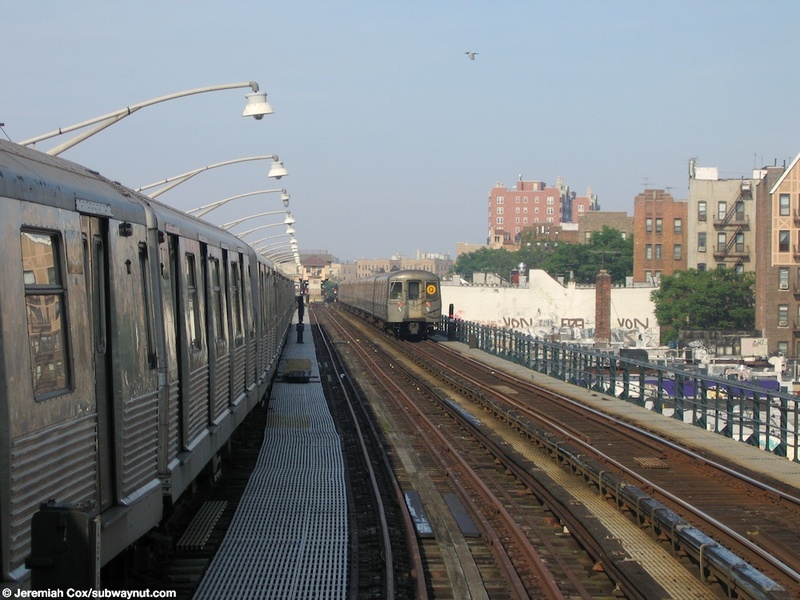 8 June, 2005 (ocean_pkwyq2) A R68(A) Manhattan-bound Q train has left the Ocean Parkway Station, to continue to Brighton Beach, the R40/R40M mixed-consist of a Not-in-Service B train parked on one of the extra tracks is visible. 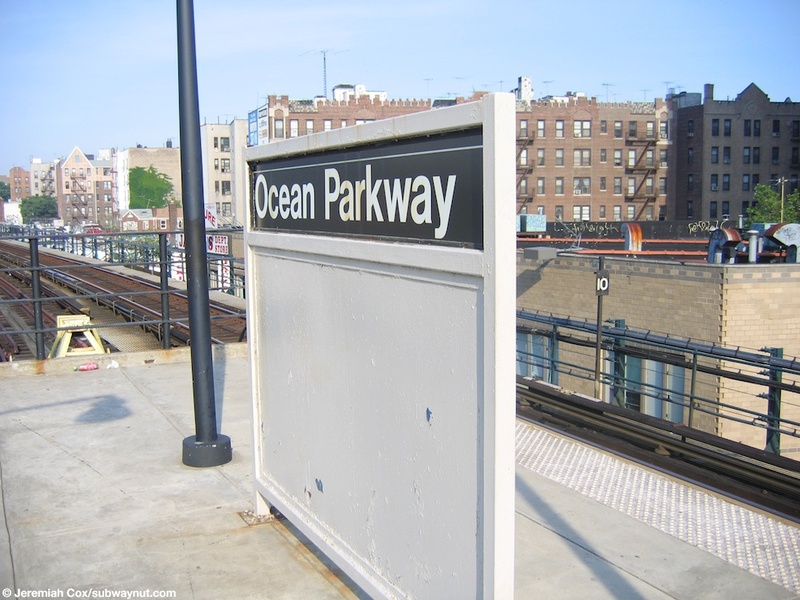 8 June, 2005 (ocean_pkwyq3) A simple Ocean Parkway sign on top of a small windscreen on the extreme eastern (northern) end of the Manhattan-bound platform. 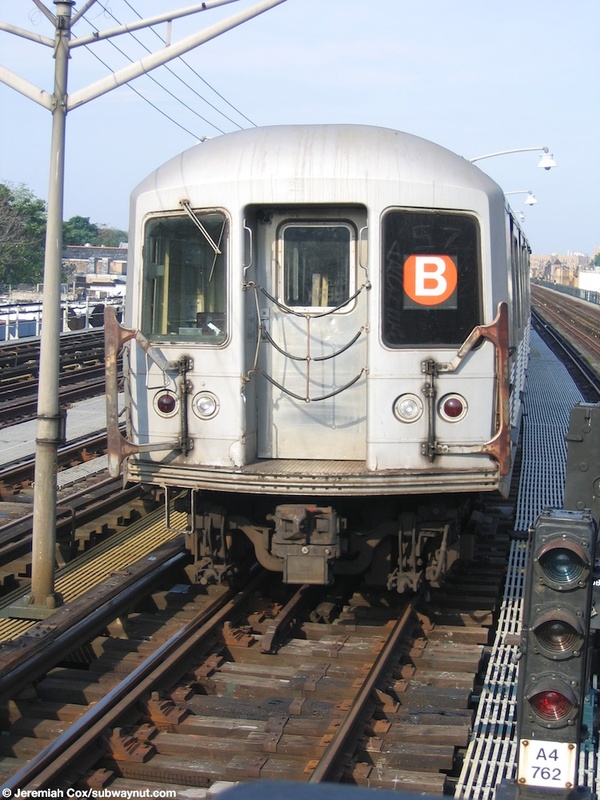 8 June, 2005 (ocean_pkwyq4) A final close-up view of R42 #4953 parked just east of the Ocean Parkway Station. (ocean_pkwyq5) A R68(A) Coney Island-bound Q train leaves Ocean Parkway, passing the decorative looking lampposts that are on the side of the concrete elevated structure that crosses over Ocean Parkway, the wide urban Boulevard. 13 August, 2008 (ocean_pkwyq6) The eastern end of canopies, at Ocean Parkway, it's also right where the staircase down to the eastern fare control area is. 13 August, 2008 (ocean_pkwyq7) An Ocean Parkway platform windscreen, is now painted green instead of a cream color. 13 August, 2008 (ocean_pkwyq8) Looking down the platforms at Ocean Parkway on the exposed eastern end of them. 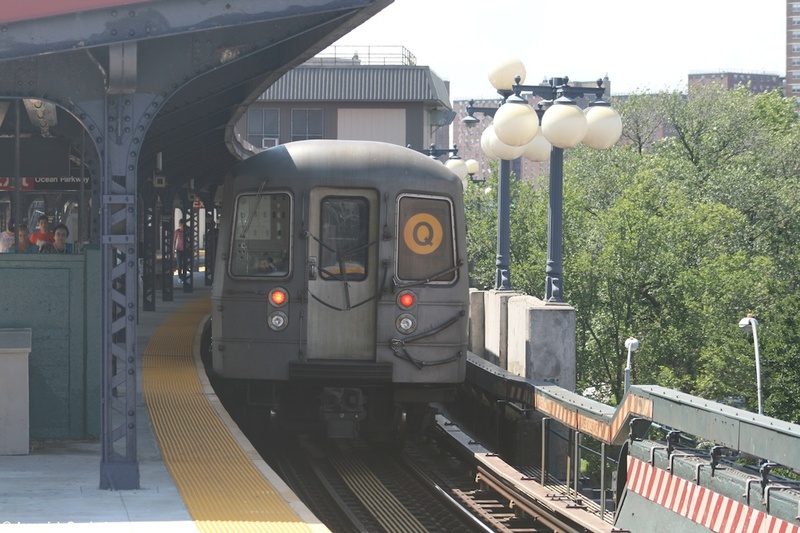 (ocean_pkwyq9) Zoomed east of the Ocean Parkway Station at a R68(A) Q train that is passing a R40M B train, parked on one of the pocket tracks. 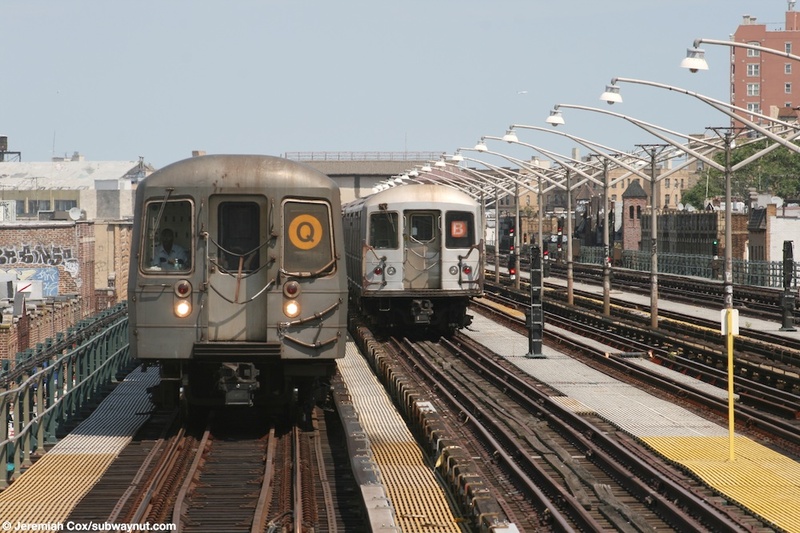 13 August, 2008 (ocean_pkwyq10) A R68(A) Q train continues to approach the Ocean Parkway Station, with a R40M B train still visible behind it, parked on one of the pocket tracks. 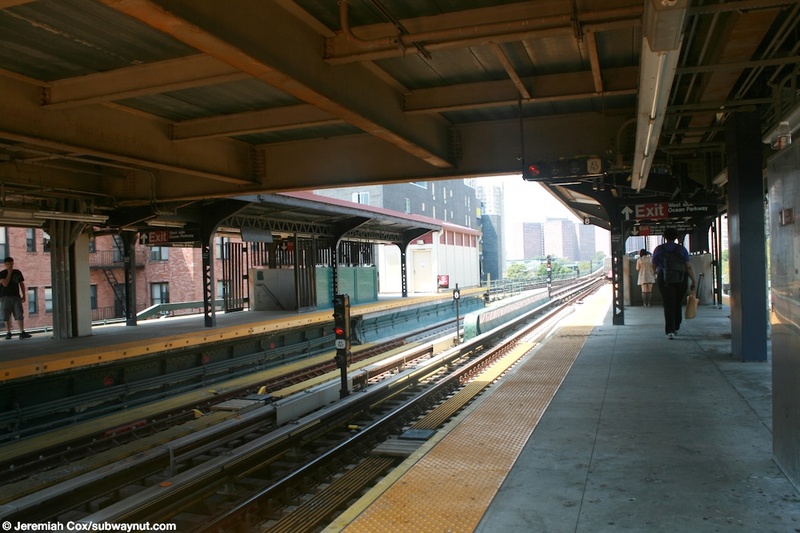 13 August, 2008 (ocean_pkwyq11) Looking down the Coney Island-bound platform at Ocean Parkway. 4 August, 2009 (ocean_pkwyq12) Continuing down the platforms at Ocean Parkway, the 'No' entry staircase up to a small house above the station that is labeled Signal department is visible. (ocean_pkwyq13) Beneath the signal department's building above the tracks at Ocean Parkway, and approaching the pair of staircases down to the West Side of Ocean Parkway exit. 4 August, 2009 (ocean_pkwyq14) In front of the staircase down to the exits to the Western side of Ocean Parkway. 4 August, 2009 (ocean_pkwyq16) Another view of the decent sized station house beneath the tracks, this time outside of fare control, for the exit to the Western side of Ocean Parkway.